Boulder is ready for summer! The month of June is absolutely packed with fun events including live music, outdoor festivals, ballet, theater, movies in the park, parties, athletic events, dancing and so much more. All happening this June in and around Boulder. The Boulder Dinner Theater is putting on a production of The Little Mermaid this summer! In a magical kingdom beneath the sea, the beautiful young mermaid, Ariel, longs to leave her ocean home to live in the world above. Based on one of Hans Christian Andersen’s most beloved stories and the classic animated film, Disney’s The Little Mermaid is a hauntingly beautiful love story for the ages. With music by eight-time Academy Award winner, Alan Menken, lyrics by Howard Ashman and Glenn Slater and a compelling book by Doug Wright, this fishy fable will capture your heart with its irresistible songs, including “Under the Sea,” “Kiss the Girl” and “Part of Your World.” Special Event: TEA & SWEETS WITH ARIEL AND FRIENDS! BDT Stage is having tea under the sea! Grab your dinglehopper and get all dressed up for a tea party with Ariel and friends! Party includes character meet and greet, activities, tea and sweets. Space is limited. $25/person. Make your reservations for one of our 3 tea parties on June 9, 23, and 30 by clicking here. Downtown Longmont gives you the chance to dance in the street and enjoy great live music from local and regional artists this summer with their 10th Annual Downtown Summer Concert Series. Every Friday in June, concerts will be held along 4th Avenue between Main and Kimbark Streets from 6-9:30 p.m. Enjoy live music, local food, a craft beer garden and FREE admission under the stars of the Downtown Longmont Creative District. Music Lineup includes June 1: FACE Vocal Band, June 8: Last Men on Earth, June 15: Bonnie & The Clydes, June 22: Policulture, June 29: Quemando. Where: Please pick up your tickets, map and “swag bag” at 840 Mapleton (corner of 8th and Mapleton, at the old Mapleton school). Cost: $15/Advance tickets for adults 12+, $20/At the door. Kids under 12 are FREE. Tickets available here. All proceeds support Whittier International Elementary School, tickets are tax deductible. Time: 8:30AM – 11PM, schedule here. Cost: $10 Adults, $5 Kids 5- 12, Kids 4 & Under are FREE. Tickets can be purchased here. Cost: $30 – $40, Tickets available here. TEDxBoulder kicks off their first event of 2018 with the theme Truth & Daring, bringing powerful and inspiring talks to you. TEDxBoulder: Truth & Daring is an evening of live presentations focused on ideas worth spreading. These empowering and educational presentations bring thousands of people together to connect in community, arts, technology, and entertainment. Ticket includes a light picnic-style snack, world-class speakers and entertainers, and an opportunity to make meaningful connections to others where we live, work, and play in the stunning backdrop of the Boulder Flatirons. Ride the FREE HOP 2 Chautauqua shuttle to this show! Click here for more info. Cost:$8 General Public, $5 Museum Members. Tickets available here. Revisit your childhood as you watch favorite cult-classic films at the Longmont Museum and Cultural Center. Enjoy films from days of yore while sipping a specially paired signature cocktail. Each night starts with movie-themed trivia! On June 7, see The Never Ending Story, on June 14, see Hook. Cost: Ticket prices vary, see prices here. Live entertainment at beautiful Chautauqua Park will be happening all summer long! Chautauqua 2018 Summer Concert series is presenting a variety of comedians and musicians. The 2nd annual Boulder Plein Air Festival will take place this June! A week-long celebration of remarkable landscapes, scenic cityscapes, unique workshops, and wonderful free events from June 11-18, 2017. Open Studios invites you to observe master painters in action—making their art on location in beautiful Boulder. You are also invited to participate in the creativity yourself, with plenty of festival activities open to public participation. Kids art opportunities available. Celebrate creativity with us and enjoy receptions, exhibitions, lectures, and opportunities to collect your next masterpiece at the Boulder Plein Air Festival! Once again, Twenty Ninth Street is going to rock, swing and jive with the summer concert series. Join the fun at Twenty Ninth Street’s Central Plaza next to West Elm, where The Barrel is located for food, drinks and dancing under the stars. A Boulder tradition for families in the summer! Join the musical duo Jeff and Paige for evenings of children’s music and nature education. The evening consists of a short hike, followed by 45 minutes of nature music at the foot of the Flatirons. Sponsored by City of Boulder’s Open Space and Mountain Parks Division Meadow Music is an award-winning environmental education program at Chautauqua Green in Boulder, Colorado.! The event begins at 5:30 with a short hike that’s friendly to all ages (please arrive early to find a place to put your picnic blanket before the hike). After the hike, the group returns to Chautauqua Green for a concert full of original nature and science-based music by Jeff and Paige. The concert starts around 6:00pm and ends by about 7:00. Bring a blanket to sit on, a picnic and some silliness! From oldies to alternative and everything in between, Bands on the Bricks is Boulder County’s premier outdoor summer concert series taking place in the heart of the city on the bricks of the one-and-only Pearl Street Mall. A not-to-be-missed summer tradition with 10 weeks of free concerts. Enjoy performances from the best local musicians along the front range while dancing under the stars. Featuring an outdoor beer/wine/margarita garden starting at 5:30 p.m. every Wednesday night, featuring Rio Margaritas and a local brewery. This summer’s brewery line-up includes: West Flanders (June 6 – June 27), The Post (July 4) and Avery Brewing Company (July 11 – August 8). Cost: Starts at $20. Tickets available here. The Colorado Shakespeare Festival was founded in 1958 and is still going strong. Held every summer at the picturesque Mary Rippon Outdoor Theatre and the indoor University Theatre on the University of Colorado Boulder campus, this festival is consistently among the most critically acclaimed of its kind in the nation. This year, performances will include Love’s Labour’s Lost, Richard III, Edward III and non-Shakespearean plays: You Can’t Take it With You and Cryano de Bergerac. CSF’s award-winning education program also presents classes, workshops and camps for all ages throughout the year. Cost: $35 Advance / $45 Day of Event Tickets available here. The 6th Annual Outdoor Erie Brewfest features 24 local breweries offering their best IPA’s, ambers, and more! Ticket includes entry down Brew Lane with your commemorative Erie Brewfest tasting glass as you enjoy live music and great food. Designated drivers are no charge. If you love amazing live music in the open summer air, check out Louisville’s Downtown Street Faire. These Friday nights have everything you need for a fun, fabulous evening including food, adult beverages, live music, and a relaxed atmosphere. Music Line-up for June 2018 includes June 8: Kyle Hollingsworth, June 15: Locos Por Juana, June 22: Blitzen Trapper, June 29: Shinyribs. Watch the largest IRONMAN race in the world at the finish line and throughout the day as over 2,000 incredible athletes compete. The race will start at the Boulder Reservoir with a single-loop swim. Once finished in the water, will continue on to a beautiful multi-loop course all contained in Boulder County. The two-loop run course runs along Boulder Creek Trail, winding along the water and through city parks. Spectators will have multiple opportunities to cheer on the athletes and the last few steps of the day will take athletes up Pearl Street for a triumphant finish. View the IRONMAN website for course maps. Kids can participate in the IRONKIDS Fun Run, A non-competitive and non-timed event gives kids 15 or younger a chance to take part with a 1/4-mile or 1-mile run. Each athlete receives a race bib, finisher shirt or trucker hat, medal, goodie bag and the pride of calling themselves an IRONKID! More info here. Cost: $12, Tickets available here. Your presence is requested at the 5th annual Boulder Block Party of the ever-booming Boulder creative scene on Thursday, June 14th! Drinks, entertainment, and hashtags (#boulderblockparty) will be provided. Tickets must be purchased in advanced. 21+ Only. All proceeds from your $12 donation will benefit The Emergency Family Assistance Association of Boulder (EFAA). Time: 8:00AM to 10:00PM, schedule here. Hanuman Festival is a community-oriented yoga and music festival set at the foot of Colorado’s Rocky Mountains. Hanuman is a celebration with world-class yoga instructors, mind-blowing music, inspirational experiences and a nourishing community. Immerse yourself in body, mind and heart as you relax and rejuvenate, dance and devote, connect and expand, have fun and just be. Cost: Kids 5 – 18 $10 (discounts available for multiple kids), Adults $32, VIP $75, Kids under 5 are FREE. Tickets here. Cost: $69 – $190, Tickets available here. The BIG 10th Anniversary 1940’s Ball w/ Bob Hope, Frank Sinatra, Hollywood’s Satin Dollz & A WORLD FAMOUS ORCHESTRA! Step into Hollywood’s WWII planes, cars and sets! Enjoy a night of dancing with your sweetheart (or meet one) under the nose of a WWII Bomber. Enter our hangar made into Rick’s Café Americain w/belly dancers and a roulette table you can play on. Vintage cars, swing dancers, reenactors, WWII plane flybys, big bands and more. This event always sells out in advance. 2018 theme is Victory: A Celebration of V-Day! eTown Hall is hosting an intimate evening of music with John McEuen & The String Wizards! Unlike eTown’s Live Radio Show Tapings, their ‘Homevibe & eTown present’ series are uninterrupted, full concerts that take place in eTown’s solar-powered home in Boulder, CO, eTown Hall. For all the details, click here. Cost: $15, Tickets available here. Join the “Best Big Band in Denver”, The Flatirons Jazz Orchestra, for a night of romance and excitement as we recreate the great dance music of the Swing Era, Duke Ellington, Benny Goodman, Count Basie, Glenn Miller, Stan Kenton, Gene Krupa, Ella Fitzgerald, Billie Holiday, Diane Schuur, Buddy Rich, and more. FREE swing dance lessons at 7:00, Three hours of live Big Band jazz from 8:00 to 11:00 PM. Singles, beginners, all ages welcome. Snacks provided. Vintage dress encouraged. No bar, but you can bring your own wine or beer. 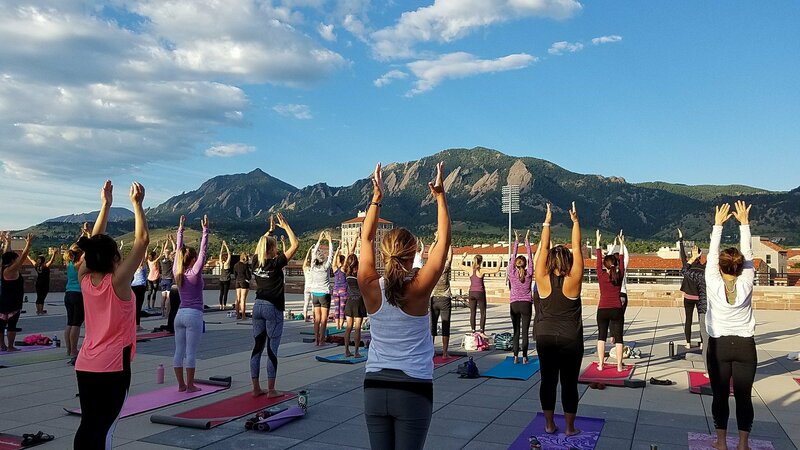 Experience Boulder’s most breathtaking views and an exhilarating yoga practice on the Rooftop Terrace at Folsom Field. This fun class is led by Jo Marchi, founder of JoMar Yoga, with alignment correction provided by UCHealth physical therapists. Just bring a yoga mat and water bottle! This class is FREE. Cost: $25 for 2 Hour rental for paddleboard or kayak. ($1 ACA Admin fee) = $26.00 total. Join Always Choose Adventures for paddleboarding or kayaking at Union Reservoir. Choose your own adventure with this event. Always Choose Adventures partnered with Rocky Mountain Paddleboard to give members a special discount for a paddleboard or kayak rental. Look for the ACA flag at the reservoir. Bring a towel, lots of sunscreen, plenty of water, your bathing suit and a smile. Barrio E’ & the Latino Chamber are hosting the Colorado Latino Festival in the beautiful City of Boulder in order to highlight what the city is doing to create and maintain relations with its multicultural population. This year, the festival will be expanded to a week long of activities for all to enjoy by partnering with local organizations to do even more. More than 100 vendors will be on site including expositors, artists, resource tables and activities for the whole family. Food trucks will be on site. Musicians and entertainment include: Jyemo Club & Barrio E’, dancing with Los Chicos, Orquestra La Brava, Los Mocochetes and Pink Hawks. Where: Around Longmont, schedule here. Time: Full schedule available here. Out Boulder County‘s annual Longmont Pride Week is from Monday, June 18th to Saturday, June 23rd, 2018. There are a ton of fun events happening all week long. Pride Week concludes with the Longmont Pride Festival on Saturday, June 23rd from 2:00pm to 6:00pm on 4th Street between Main and Emery Street in Longmont. The day will be jam-packed with activities, amazing community partners sharing information, Pride merchandise galore from Out Boulder County and other wonderful vendors. Jewelry from talented artists, flash-mobs, photo booths, a dunk-tank, and multiple activities will be available throughout the day. Cost: $12 Adult, $8.50 Senior 62+, $8.50 Student, $6.50 Member Tickets available here. Prophet. Author. Poet. Conservationist. Radical. Mystic. Valuing our natural wild places for their transformational qualities and encouraging everyone to deeply experience nature for its spiritual nourishment, The Unruly Mystic: John Muir explores the remarkable life and influential works of a patron saint of environmental activism. This movie is a personal and an inspirational journey by local filmmaker, Michael M. Conti. It is second in a series after The Unruly Mystic: Saint Hildegard (2014). Q/A with filmmaker after the screening. Where: Times and locations vary, click on links below for stations in your area. Time: Times and locations vary, click on links below for all the info. Leave your keys at home, hop on your bike and join thousands of Coloradans as they bike to work on Wednesday, June 27. Bike to Work Breakfast stations in Boulder are open from 6:30 – 9:00 AM. Water stations are open from 3:30 – 6:00 PM, offering water only. Bike Parties may have variable hours in the evening. The Town of Superior will be hosting a breakfast station along the US 36 Bikeway and the Coal Creek Trail. The breakfast station will be open from 6:30 am – 9:00 am. Stop on your ride to work for some yummy free food, drawings, a bike tune up and fun giveaways. Hope to see you there – ride safe! Breakfast stations will also be offered in Longmont, Broomfield, Lafayette, and Louisville. Colorado Music Festival presents a six-week summer concert season at Chautauqua Auditorium in Boulder showcasing the Colorado Music Festival Orchestra. Inspired programming performed by exceptional national and international musicians has earned Colorado Music Festival recognition from the League of American Orchestras and the National Endowment for the Arts. Full schedule available here. Cost: $10/ticket Friday, $5/Ticket Saturday & Sunday. Tickets available here. Vintage Market Days is back at Boulder County Fairgrounds this June with the theme: Old-Fashioned Summer. Check out this upscale vintage-inspired market featuring original art, antiques, clothing, jewelry, handmade treasures, home décor, outdoor furnishings consumable yummies, seasonal plantings and a little more.